Would you like to take your drum playing potential to the absolute max? Want a fast and effective way to accomplish it from within? Great drummers know their kit back to front. They can produce the simplest of rhythms, most complex drum rolls, and everything in between, exploiting the variety and dynamic range of the instrument with power and control. 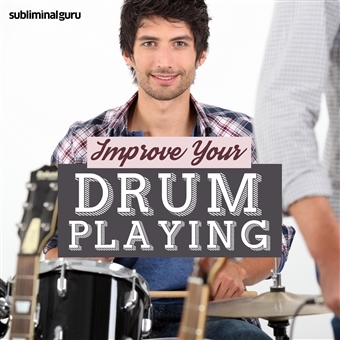 With the Improve Your Drum Playing subliminal session, you'll unleash your natural musical ability! You'll start to relax and let your talent take over, trusting in your instincts. You'll quickly familiarize yourself with rhythms and patterns, able to produce music with confidence and finesse. 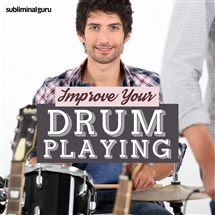 Download the Improve Your Drum Playing subliminal audio now to become a skilled and polished percussionist as quickly as possible. I have a great sense of rhythm. I use the whole kit to my advantage. I play the drums musically. People admire my drumming ability. I know how to blend in with a group. My stick technique is superb. I can play at any speed or volume. I practice rhythms and patterns every day. I keep the beat naturally and efficiently. Drum playing comes easily to me. I'm a dynamic and talented drummer.